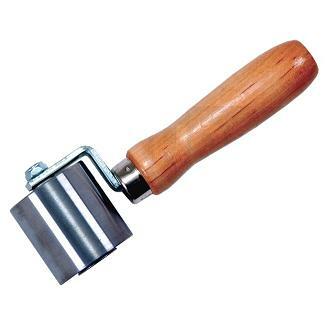 PRODUCT: 2" DIAMETER x 2" WIDE, SINGLE-FORK STEEL SEAM ROLLER WITH HARD WOOD HANDLE. PRICE/EACH. Heavier steel roller is ideal for use with roofing products and general seam work. Offset single forks for close access to sidewalls and corners.